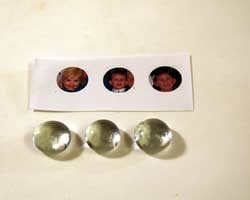 These cute photo magnets from far away look nice, shiny, and decorative, but a closer look will reveal your child's face inside the stone, smiling back at you! This is a neat effect and the craft is amazingly simple to do. This would make a perfect gift for a Mother or Grandparent. 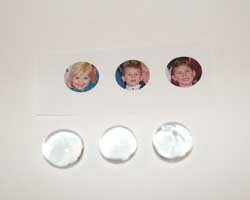 The photo magnets are made from clear flat marble stones, which are usually used as a decorative element in the bottom of clear vases or around candles. You can buy them in little net bags, at most discount stores and definitely at the craft store! Check the by the floral section and/or by the vases and candles. 1. 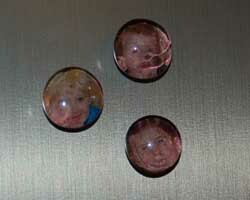 If you have photo editing software, scale down the photo of your child's face to the size of the glass marble. You may need to print it a few times to see what size works. Then use the crop function, and crop the photo in the shape of a circle. If you do not have photo editing software, you can reduce the size of the photo using your printer settings, and you can do the circle cropping by hand using your scissors. Print the photos on regular printer paper, not photo paper. The image may not be quite as good, but the photo paper is too thick for decoupaging. Set the printer setting on "best" quality possible, and increase the ink volume used. This will help create a good image. 2. Carefully cut out the photos from the paper. 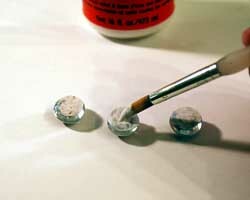 Then, brush on some decoupage medium to the back (flat side) of each stone. Adhere the photo to the stone, facing the picture side onto the back of the stone on the glue. The photo will show through the other side. The glass also has a magnifying effect so the face will appear bigger. Then, brush decoupage medium over the back of the photo and around the glass stone to seal everything in. Allow to dry. 3. 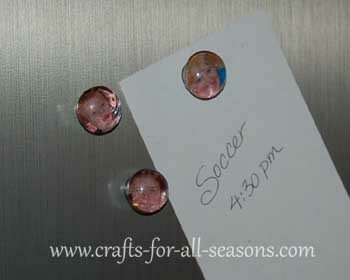 Glue on a small button magnet to the back when the decoupage is dry. 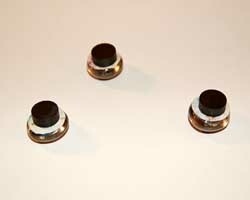 Try to use a nice strong magnet. Nothing is worse than having a magnet that cannot hold anything up on the fridge. Enjoy your photo magnets!